The MySQL database server is used as back end storage for most of the transaction services, and is provided by SD in three flavors. The enterprise edition is the most commonly used Open Source one, and has all functionality of a standard database system. 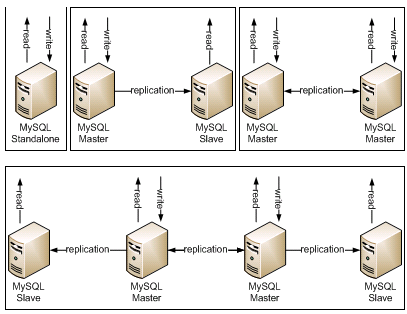 It can also be configured to do Master-Slave replication, and even Master-Master, possibly with additional slaves. The Carrier Grade Cluster edition is the Open Sourced version of MySQL cluster. It has a limited set of functionality to allow better cluster performance. It is more rarely used than the Community edition. There is also a Commercial Cluster edition available from MySQL itself, but so far, we haven’t been using it. In a cluster setup, SQL front-end nodes handle queries and contact the data nodes to satisfy them. 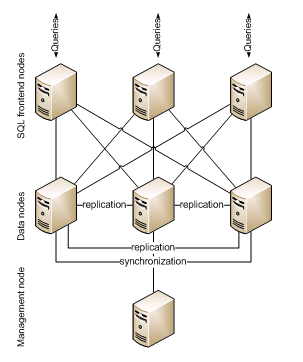 The data nodes are kept in sync by a management node. Application software which can use the corresponding API itself may also access the data nodes directly.